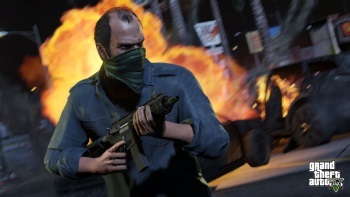 A retailer in the French town of Montargis had a not-entirely-pleasant encounter with police after two employees dressed up for the Grand Theft Auto V launch with masks and guns. The Grand Theft Auto V launch was a pretty big deal, so retailer Micromania in the French town on Montargis decided to make the most of the moment and had a couple of employees dress up for the day for day in appropriate garb: masks and toy guns. Alas, a concerned citizen passing by the shop took dress-up day a little more seriously than intended and called the police, reporting that the joint was being robbed. Within minutes, a team of about 15 police officers, some packing submachine guns, surrounded the store, ready to inflict Gallic justice on the ne-er-do-wells within. Fortunately for all involved, it very quickly became clear that the whole thing was a misunderstanding. The owner of the store explained the situation to police, who apparently weren't amused; one officer told La Republique du Centre that "it could have ended very badly" and that it was lucky nobody was hurt. A bit of an overreaction, perhaps, but understandable, according to The Local: The French Riviera has apparently suffered a string of high-profile heists over the summer, and earlier this month thieves made off with €2 million ($2.7 million) in loot after "ram-raiding" a Paris jewelry store.